Both sevoflurane and propofol were used to control surgical hemodynamic responses. This study was carried out to compare the effect of inhalation bolus dose sevoflurane and bolus dose propofol on cardiac parameters using an esophageal Doppler monitor. Sixty patients scheduled for elective herniorrhaphy were randomized into two groups: group S (n=30) and group P (n=30). When a positive sympathetic response occurred [defined as a 15% increase in the heart rate (HR) and the mean arterial pressure (MAP)], patients in group S received an inhalation bolus of sevoflurane 8 vol% in 6 l/min O2, whereas patients in group P received bolus propofol 300 mcg/kg/min. Both boluses were maintained until MAP and HR reverted to baseline measurements. Esophageal Doppler was inserted immediately after intubation. Cardiac parameters, cardiac output, cardiac index, stroke volume, stroke volume index, peak velocity, and flow time corrected, were recorded 10 min after intubation (T0), which were considered as baseline values, with the occurrence of a sympathetic response (T1) and when MAP and HR reverted to baseline values (T2). There was a significant reduction (P<0.05) in the cardiac parameters in group P compared with group S.
The present study showed that inhalation bolus dose sevoflurane attenuated hemodynamic responses similar to those with propofol with less myocardial depressant effects and in a shorter duration of time. Ideally, an airway for a surgical procedure should be secured with the method that offers the greatest safety, the most efficiency, and the least morbidity. General anesthesia for oral and maxillofacial surgery is one of the most challenging tasks for an anesthetist. Nasotracheal intubation is usually required in these patients to allow an unrestricted surgical approach. It poses an interesting problem, particularly when associated with difficult airways. The GlideScope video-laryngoscopy (GVL) appears to provide better glottic visualization than direct laryngoscopy. However, the effectiveness of GlideScope for nasotracheal intubation in patients for oral or maxillofacial surgery with difficult airways requires more investigation. The aim of this study is to evaluate the usefulness of GVL versus a direct laryngoscope for nasotracheal intubation in adult patients with difficult airways presenting for oral or maxillofacial surgery. In this study, the Macintosh laryngscope and the Glidescope were compared for nasotracheal intubation in 40 patients ASA I–III with difficult airways undergoing oral or maxillofacial surgery. The patients were randomly assigned to a laryngoscopic group (DL group) or a Glidescope group (GV group). Before nasotracheal intubation, all patients were given a Cormack and Lehane (C&L) grade by a separate anesthetist using a Macintosh laryngoscope. The patients were then intubated using direct laryngoscopy or the GlideScope. Outcome measures included grading of view, the success or failure of intubation, numbers of intubation attempts, time to intubation, usage of Magill forceps, and complications. There were no differences between groups with respect to hemodynamic and oxygen saturation during the study period, P greater than 0.05. There was a significant difference in laryngoscopic views according to the C&L classification. The C&L I and II views obtained by the conventional laryngoscope increased from 70 to 95% of cases with the GlideScope (P<0.05), whereas C&L III and IV decreased from 40 to 5% with the GlideScope, P less than 0.05. The intubation was successful in 95% of the patients in the GV group versus 85% in the DL group. The nasotracheal intubation performed with the direct laryngoscope (45.1±7.8 s) was significantly faster than that with the GlideScope (53.5±14.7 s), P less than 0.033. Magill forceps were used in 25% in the GV group, but were used 60% of the time in the DL group, P=0.02. The intubation failure rate was higher using the direct laryngoscope 15 versus 5% with the GlideScope, P=0.49. The incidence of a postoperative sore throat was significantly reduced in the GV group 15 versus 40% in the DL group, P=0.07. Oral and maxillofacial surgery has a potentially difficult airway, but if managed properly, the morbidity and mortality can be reduced or avoided. The GVL can be used successfully for nasotracheal intubation in difficult airways in oral and maxillofacial surgery. To evaluate the effect of injection of a subhypnotic dose of propofol on postextubation laryngospasm and cough following both total intravenous anesthesia (TIVA) and general inhalational anesthesia. The study included 120 patients divided randomly into two equal groups: the inhalation group and the TIVA group. The inhalation group was assigned to receive inhalational anesthesia with no propofol for either induction or before extubation, and the TIVA group was assigned to receive TIVA. After extubation, the frequency and severity of laryngospasm and cough within 2 min after extubation were recorded. All patients who developed postextubation manifestations received positive pressure ventilation (PPV) using a face mask, and if the condition persisted a subhypnotic dose of propofol (0.8 mg/kg) was given in conjunction with PPV. Seventy-three (60.8%) patients developed postextubation cough: 31 patients (51.7%) in the TIVA group and 42 patients (70%) in the inhalation group, with significantly higher frequency of occurrence and higher severity scores of cough in the inhalation compared with the TIVA group. Sixty-one (50.8%) patients developed postextubation laryngospasm: 24 patients (40%) in the TIVA group and 37 patients (61.7%) in the inhalation group, with significantly higher frequency of occurrence and severity of laryngospasm in the inhalation group. PPV alone allowed relief of postextubation manifestations in 43 of 49 patients; propofol subhypnotic dose in conjunction with PPV relieved laryngospasm and cough in 21 patients; nine patients required a second propofol dose, whereas two patients required reintubation and oxygenation and were readministered a third dose of propofol before reextubation, which was conducted safely with significantly higher need for the subhypnotic dose of propofol with inhalational anesthesia compared with TIVA. Propofol-based TIVA could minimize but not prevent postextubation cough and laryngospasm compared with balanced inhalational anesthesia. Subhypnotic dose of propofol (0.8 mg/kg) could be used as an adjunct to PPV as a therapeutic modality for spasm and cough, with a success rate of 93.3% for laryngospasm relief. To evaluate the effect of perioperative fluid therapy using either 6% hydroxyethyl starch (HES) 130/0.4 or gelatin (GEL) on patients’ hemodynamics, platelet function, and inflammatory response to major orthopedic surgery. Sixty patients were randomly divided into two equal groups: group A received 6% HES 130/0.4 (Voluven) and group B received GEL (Hemagel) for perioperative fluid replacement. Ten patients received only crystalloid and gave blood samples as control for analysis of serum cytokine levels. Fluid replacement was started after induction of anesthesia and continued for 48 h until the morning of the second postoperative day (POD2) to maintain central venous pressure between 5 and 9 mmHg. Hemodynamic variables, total fluid input, urine output, and blood losses were recorded. Blood samples were obtained for determination of platelet aggregation percentage and estimation of serum levels of interleukin-1β and interleukin-10 and soluble intercellular adhesion molecule-1. Designed fluid therapy regimens allowed hemodynamic stability throughout the observation period with nonsignificant differences between both groups. HES significantly maintained intravascular blood volume manifested as significantly lower volumes of HES infused compared with GEL, and also led to significantly higher volumes of urine output. GEL fluid therapy significantly affected platelet aggregation compared with baseline percentage and with those who received HES. The effect continued until POD2. In contrast, platelet aggregation in patients who received HES was significantly lower at POD1 compared with baseline percentage, but returned to near normal percentage at POD2. Postoperatively estimated serum cytokine levels were significantly higher compared with baseline levels; however, HES significantly reduced serum levels of estimated parameters compared with both control and GEL groups, with nonsignificant difference between control and GEL groups. Perioperative fluid therapy using 6% HES 130/0.4 properly maintained adjusted hemodynamic state and attenuated the proinflammatory response to surgery with reduction of adhesion molecules and minimal affection of platelet function. To evaluate the plasma procalcitonin (PCT) levels estimated at the time of (D0) and 4 days (D4) after the diagnosis of ventilator-associated pneumonia (VAP) as a predictor for mortality. VAP was diagnosed when pneumonia developed after 48 h of mechanical ventilation. Patients were evaluated clinically using the APACHE II score and septic status was graded according to Bone’s criteria. Blood samples were obtained D0 and D4 for the estimation of plasma PCT levels. Patients were categorized into two groups: survivors, that is, patients discharged through or at the end of 28 days (day 28), and nonsurvivors. Clinical data, plasma PCT levels and the D4/D0 ratio were analyzed as predictors for mortality. The study included 40 patients, but 15 patients died, yielding a mortality rate of 37.5%. The mean duration of mechanical ventilation before D0 (day of VAP diagnosis) was 5±1.5 days; 29 patients developed early VAP, whereas 11 patients developed late VAP. The mean D0 and D4 plasma PCT levels were significantly higher in all the patients compared with the control levels. The mean D4 plasma PCT levels were significantly higher in all the patients studied and in the patients categorized according to outcome compared with D0 levels and in nonsurvivors compared with survivors. The mean D0/D4 ratio of PCT plasma levels was significantly higher in nonsurvivors compared with survivors. Receiver operating characteristic curve analysis defined the D4/D0 plasma PCT ratio and severity of sepsis as significant predictors for mortality, but the difference was more significant for the D4/D0 ratio. VAP is associated with a high mortality rate and estimated levels of plasma PCT were significantly higher in nonsurvivors despite treatment compared with survivors. A high D4/D0 ratio of plasma PCT levels was found to be a highly specific predictor of mortality among VAP patients. Postoperative pain after laminectomy is a huge challenge. Caudal bupivacaine analgesia is an option but for a short duration. Dexmedetomidine, a selective α2 agonist with an α2 : α1 action of 1600 : 1, has sedative and analgesic properties and can be used before, through epidural and caudal roots, safely and effectively. Our study was carried out on 50 patients (American Society of Anesthesiologists Classification I and II) scheduled for an elective single-level lumbar hemipartial laminectomy. Patients were divided into two groups: group B (n=25) received caudal 20 ml of isobaric bupivacaine (0.25%), whereas group BD (n=25) received the same volume of isobaric bupivacaine (0.25%) mixed with dexmedetomidine 1 mcg/kg; caudal injections were administered after general anesthesia and 20 min before skin incision. The following parameters were recorded: hemodynamic changes (pulse and blood pressure), end-tidal sevoflurane, bispectral index (BIS), narcotic need intraoperatively and postoperatively, patient-controlled analgesia boluses, the observer assessment of alertness/sedation score, and the time to first void. There were no statistical differences between the groups in the hemodynamic parameters, except intraoperative and postoperative bradycardia in the BD group until 8 h postoperatively. The BD group had less fentanyl supplementation intraoperatively, lower BIS, and less end-tidal sevoflurane. Postoperatively, the BD group required a longer time for the first postoperative analgesia than B group, with a mean±SD of 495.200±95.224 and 262.000±22.913 min, respectively. The total morphine consumption was higher in the B group than the BD group, with a mean±SD of 31.760±1.269 and 25.300±0.764 mg, respectively. Patient-controlled analgesia boluses and visual analogue scale for pain were higher in the B group than the B group. Time to first void was longer in the BD group than the BD group, with a mean±SD of 448.000±36.286 and 210±10.801 min, respectively. The addition of dexmedetomidine 1 mcg/kg to bupivacaine caudally for cases of a single-level lumbar hemipartial laminectomy preoperatively leads to better analgesia both intraoperatively and postoperatively as shown by a reduced need for analgesia supplementation, together with lower intraoperative BIS. Also, patients with dexmedetomidine had a higher level of postoperative sedation and a longer first-void interval, with minimal hemodynamic effect in the form of bradycardia. Although postoperative epidural local anesthetic infusion provides potent analgesia after lower abdominal surgeries, it causes significant motor block especially with the commonly used bupivacaine concentrations of 0.125% or higher. We compared the analgesic effect of fentanyl-only epidural infusion at two different concentrations with the effect obtained with the commonly used bupivacaine/fentanyl mixture for postoperative pain after total abdominal hysterectomy operations in 90 women who were divided into three groups. Group I patients received an epidural infusion of a mixture of 200 mcg fentanyl in 50 ml of 0.125% bupivacaine; group II patients received an epidural infusion of 200 mcg fentanyl in 50 ml of 0.9% NaCl solution; and group III patients received an epidural infusion of 400 mcg fentanyl in 50 ml of 0.9% NaCl solution. It was found that in the first postoperative 8 h the visual analog scale (VAS) score in group II patients was significantly higher than that in the other two groups, which showed nonsignificant differences between them. At 12 and 16 h postoperatively, the VAS scores were nonsignificantly different among the three groups. Finally, at 20 and 24 h, group III patients showed significantly lower VAS values compared with the other two groups. Fentanyl of 400 mcg in 50 ml NaCl solution gave the same analgesic effect as the combination of 0.125% bupivacaine and 200 mcg fentanyl in 50 ml NaCl solution without any motor block, delayed ambulation, or hypotension when infused into the epidural space at the same rate of 10 ml/h for postoperative pain relief after total abdominal hysterectomy. A fascia iliaca compartment block (FICB) performed in patients with hip fracture before spinal anesthesia can help facilitate patients’ positioning and reduce the postoperative analgesic requirements; however, the duration of FICB is limited to the early postoperative period. Magnesium has been shown to prolong the duration of analgesia when coadministered with local anesthetics for peripheral nerve blockade. To determine the effect of the addition of magnesium sulfate to bupivacaine on the duration of analgesia provided by FICB in patients undergoing surgery hip fracture. Forty-four patients (50–79 years old) scheduled for hip fracture repair were randomized to either group B, which received FICB with 30 ml bupivacaine 0.25%, or group MB, which received FICB with 30 ml bupivacaine 0.25% containing 250 mg magnesium sulfate. Sensory blockade in the anterior thigh (supplied by the femoral nerve) and pain scores at rest and on movement were assessed 30 min after FICB. Then, the patients were transferred to the operating room, instructed to sit for spinal anesthesia, and satisfaction with the sitting position was recorded (yes/no). Postoperatively, pain scores at rest and on movement at 4, 8, 12, and 24 h after FICB, time to first analgesic requirement, total tramadol given in the first 24 h after FICB, and the occurrence of adverse effects were also recorded and compared between the two groups. Patients who received magnesium had a longer time to first analgesic administration, lower pain scores on movement at 8, 12, and 24 h after the FICB, and lower tramadol consumption for postoperative pain. No complications related to FICB were reported. The addition of magnesium to bupivacaine for FICB significantly prolongs the duration of analgesia and reduces opioid demand, without side effects. 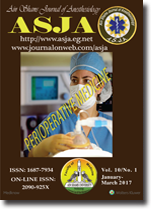 Ultrasonography seems to be the most suitable image modality for regional anesthesia. Perhaps the most significant advantage of ultrasound technology is the ability to provide an anatomic examination of the area of interest in real time, which allows one to visualize the neural and the surrounding structures and visualize the pattern of local anesthetic spread. The aim of this study was to evaluate ultrasound-guided nerve detection in an interscalene brachial plexus block and to compare it with nerve stimulator-guided nerve detection in terms of simplicity, safety, and efficacy. Sixty patients were scheduled for unilateral shoulder surgery, shoulder arthroscopy, or surgical neck humerus surgery. They were randomly divided into two groups (30 patients in each group): group I: those patients who received an interscalene brachial plexus block through ultrasound guidance and group II: those patients who received an interscalene brachial plexus block through nerve stimulator guidance. The time required to perform the procedure was significantly less in group I=5 (1) min compared with group II=6.2 (1.3) min. The block was successful in all patients of group I whereas two patients in the nerve stimulator group (group II) failed to achieve complete surgical block but the patients were excluded from the study. This failure was statistically not significant. Morphine consumption was statistically lower in group I 4 (1) mg/24 h than in group II 7 (1) mg/24 h. Undesirable events were not observed among patients in group I, whereas three patients of group II (10%) had a complicated course such as delayed paresthesia, dyspnea, tinnitus, and circumoral numbness, but the difference between both the groups was not statistically significant (P>0.05). The degree of satisfaction showed a significant difference, favoring ultrasound guidance (group I) (86.6%) compared with group II (53.3%). An ultrasound-guided interscalene block offers shorter time, faster onset, prolonged duration of analgesia, more patient satisfaction, and less morphine consumption for postoperative analgesia, with no significant differences in terms of the success rate and complications, in comparison with the nerve stimulator-guided interscalene block. Background Using the classic approach, the authors compared the success rate and time of onset of a sciatic nerve block after eliciting plantar twitches with those obtained after eliciting dorsal twitches. Methods Eighty patients, who underwent cruciate ligament reconstruction, underwent a classic sciatic nerve block procedure after eliciting plantar twitches of the foot or toes (group 1) or after eliciting dorsal twitches (group 2). The success rate of achieving a complete sciatic nerve block and its time of onset were recorded. Results In group 1, a complete sciatic nerve block was achieved more frequently, and the time of onset of sensory and motor blocks of the tibial fibers of the sciatic nerve was more rapid (86.8%; 10.8 ±5 and 12.5 ±6 min, respectively) compared with that in group 2 (57.5%; 20.6± 7 and 23±10.8 min, respectively; Po0.05). Conclusion Using the classic approach, eliciting of plantar twitches (tibial fiber stimulation) may result in more frequent achievement of a complete sciatic nerve block compared with eliciting of dorsal twitches (common peroneal fiber stimulation). Transforaminal epidural injections have the advantage that medication can be placed directly around the dorsal root ganglion pathologically involved in causing a patient radicular pain. Medication in the epidural space will tend to flow in the direction of least resistance. With interlaminar paramedian cervical epidural injections, the medication tends to spread unilaterally in 51% and ventrally in only 28%. Forty patients received a cervical epidural injection after the failure of conservative treatment. They were divided into two equal groups: the first group included 20 patients who received cervical epidural injections using a combination of corticosteroids and local anesthetic (dose: 1.0 ml of 1% lidocaine with 2.0 ml of dexamethsone 4 mg/ml for a total volume of 3.0 ml). The second group included 20 patients who received cervical epidural injections using only a local anesthetic (dose: 1.0 ml of 1% lidocaine with 2.0 ml normal saline to increase the total volume to 3 ml). There was a statistically significant increase in the visual analog scale (after–before) in group A in comparison with group B (5.49±0.82 vs. 3.65±1.18, respectively). According to the results of the present study, using a single injection for the treatment of cervical radiculopathy presenting with radicular pain, the combination of steroids and local anesthetics did provide more symptom reduction than the local anesthetics. Although the inter-relationship between opioid analgesics and the immune system is not a simple one and may appear to vary depending on the opioid studied, the dose range of the opioid, the species in which studied, the immunological parameters measured, and the time course of the study, increasing availability of data indicates that opioid prescription and usage is lagging behind the available evidence of significant opioid-induced immunosuppression in humans in a variety of disparate situations. Seventy patients complaining of cancer-related pain were randomly assigned to two groups of 35 patients each. The tramadol group was treated with tramadol hydrochloride 100–200 mg three times daily and followed up. The morphine group was treated with controlled-release morphine sulfate tablets 30–60 mg twice daily and followed up. Systolic and diastolic arterial blood pressure, the mean heart rate, and the mean respiratory rate were measured. Pain was assessed by verbal rating score and the psychological state of the patients was assessed using the General Practitioner Assessment of Cognition score. The daily activities of the patients were assessed by the Lawton Instrumental Activities of Daily Living Scale and were reported before starting therapy, 2, 4, and 6 weeks later. A laboratory study was performed by measuring the serum level of interleukin (IL)-2, and interferon (IFN)-γ before treatment, and after 2 weeks and 6 weeks. There was a significant difference in the respiratory rate, verbal rating score, and psychological state of the patients between the two groups. The concentration of IL-2 in the serum of patients in the morphine group decreased significantly compared with that in the pretreatment phase (174.86±31.91, 124.44±33.68, and 110.2±22.46 pg/ml), respectively, whereas it increased in the tramadol group compared with the pretreatment phase (177.14±20.83, 217.87±24.01, and 219.58±21.03 pg/ml); these changes were statistically significant. The concentration of IFN-γ in the serum of patients in the morphine group was found to decrease significantly compared with that in the pretreatment phase (106.82±4.52, 97.62±10.17, and 95.89±9.59 pg/ml), respectively, whereas it increased significantly in the tramadol group than that in the pretreatment phase (101.72±2.99 pg/ml, 125.51±8.71 pg/ml, and 139.93±6.35 pg/ml), respectively. Both IL-2 and IFN-γ showed no significant changes between both groups at baseline value, while later on, they were significantly higher in tramadol group than morphine group at all other studied periods. There were significant changes in the immune response and adequate pain relief in cancer patients treated with either tramadol or morphine, with fewer side effects than expected.